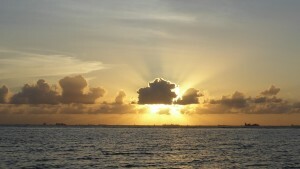 I left the sheltered bay at Panamarina early on a windy morning. Waves were breaking on the surrounding reefs but the channel is well marked and it was no problem. 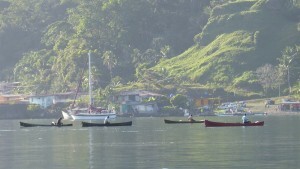 Then a fast downwind run to Portobelo. While moored at the marina I had taken the sail off and restitched all the batten attachment patches to strengthen them and done a bit of maintenance work on the battens where corrosion of the aluminium poles was showing here and there. Everything held together nicely in the strong wind and the sail was setting well. It had been quite a challenge to re-rig it in the fresh breeze that had blown for days on the mooring, so it was good to have a meaningful shake-down cruise. 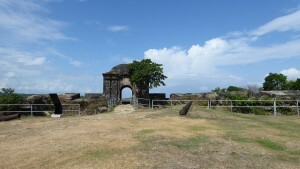 The wind was still blowing hard when I reached Portobelo but I found a good place to anchor on the North side of the bay near to the old fort. With the strong wind from the NE it was quite comfortable but it would be a long row to get across to the village. I had no real need to go ashore so spent the weekend, which I discovered was in fact the long Easter weekend, happily on board doing some of the many jobs still to be done and watching life going on around me. On Monday I sailed on for another 11nm to a very attractive anchorage behind a small island called Naranjo Abajo (Lower Orange Tree). It was one of a pair and with a long section of reef extending from its southern point formed a beautifully sheltered place to stop. I wasn’t in too much of a hurry to reach the busy harbour at Colon so I spent another peaceful night. Looking out to sea at sunset I was amazed to see how many big ships were anchored off waiting for their chance to transit the canal. I felt quite proud to be part of the impressive fleet. Next day it was time to face reality and I reached the entrance to the harbour at about 10am and prudently motor-sailed the last stretch through the anchored ships and in to Shelter Bay Marina. I hadn’t originally planned on going into the marina which is rather costly, but I had decided to use an agent to organize the canal transit for me and he insisted that I go in there to get measured. He warned me of all the crime and gangs in the town. I listened attentively and thought of the many times I have walked through the town between the supermarket and the bus terminal without any problems. So into the marina. Not my favourite habitat. Surrounded by shiny super yachts and lots of people, many of whom had never seen anything like my little boat before with its strange mast and sail. I found myself doing a lot of explaining about how the junk rig worked. I doubt if I have made any converts. The admeasurer arrived as promised the next day and I filled in a stack of forms and paid out a stack of money and was given a date for doing the canal. It was to be Tuesday, 17th April. With nearly two weeks to wait I decided to save some cash and move a further 10 miles along the coast to the Rio Chagres where one can anchor in the river surrounded by virgin rainforest. The Eric Bauhaus charts provided details of the entrance and I had no problems finding my way in. There is a patch of reef and a bit of a sand bar at the mouth of the river but I never experienced less than 4m. 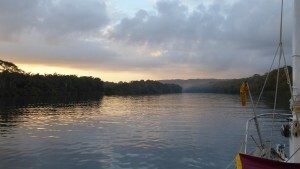 Once inside, the river is quite deep and I anchored in a peaceful spot a little way past a small dock. 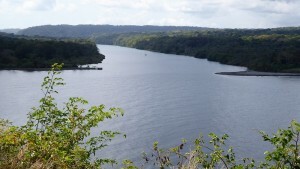 It is possible so sail all the way up to the dam which was built to form the Gatun Lake which supplies water to the locks of the canal. Before the canal was built ships used to go up the river to get as far inland as possible before using the railway to Balboa. I rowed ashore early one morning and walked along the track to have a look at the ruins of the big fort guarding the entrance to the river. As I approached the small beach 3 army guys in camouflage gear came down to meet me and showed me where to tie up the dinghy. 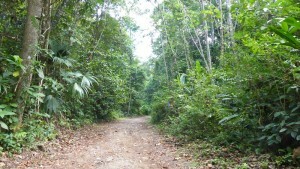 Then it was a lovely walk along the road through the jungle. My favourite blue morpho butterflies fluttered by and I managed to actually get a shot of one which is just visible as a blue fleck in the photo. The fort itself, Castillo de San Lorenzo, is well maintained with lots of information posters in Spanish and English detailing its history. Many attacks by marauding famous-name pirates such as Francis Drake and Henry Morgan, caused it to be repeatedly rebuilt. Now it is a good photo-op for tourists and provides a wonderful view of the river. I pottered about happily until the crowds started to arrive and then made it back to Speedwell. I had hoped to get a Wi-Fi signal from the top of the hill but no luck. It would have been good to get a weather forecast as I had been warned that if there was a very big swell the entrance becomes a bit hazardous. I couldn’t afford to miss my canal date. I decided to sail back to Portobelo and wait there until nearer to the date. Leaving early the next morning I got the sail up and motored past the sand bar and reef. Once I was in the open sea I switched off the engine and tried to sail. The wind was very light and coming from exactly the direction I was hoping to go. 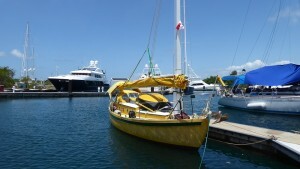 It was about 26 miles to Portobelo and at 1.5 knots it was going to take some time. Having to tack all the way would probably double the distance. I decided to fire up the engine again and use it to help us along. Oh dear. When I turned the key there was only a sad little click and no hearty roar of my 13HP engine starting up. No panic, this had happened before and I had been shown how to give the solenoid a tap which caused whatever was stuck to get moving again. It worked last time, but not today. I had a look at all the connections I could see but everything looked OK. I tried tapping the solenoid again. It wasn’t going to work this time. Well it was a lovely day and the Navik could handle the steering so we sailed slowly along. By the time we reached the entrance to Colon harbour it was already 14:30 and I thought it might be a better idea to make my way back to Shelter Bay and get things sorted out there. I had managed to pick up a Wi-Fi signal as we neared civilization and the forecast was for less wind not more. I didn’t fancy being becalmed off Portobelo with no engine. Once I was able to turn towards the harbour entrance I had the wind behind me and we sailed gracefully through and up to the entrance to the marina where I anchored off and rowed in to try and organise a tow for the last little bit. I was definitely not brave enough to try tacking in between all the shiny boats. Now I had to solve the starter motor problem as quickly as possible. Eventually, after two days of groping about getting greasy and checking out connections and getting advice from helpful people the fault was found by Greg, the resident mechanic. It was a tiny connector hidden behind the alternator which only became accessible once I had removed the obstructive alternator. Once identified, it took a few minutes to replace the connector and we were back in business. I had contacted the canal agent to say I might have to delay my transit, but luckily my date for the 17th is still available so now all I have to do is get the boat organized to accommodate the four required line handlers. Its going to be a tight squeeze finding a place for them to sleep on board if we have to anchor overnight in the lake. This entry was posted	on Thursday, April 12th, 2018 at 22:31 and is filed under Cruising, Panama. You can follow any responses to this entry through the RSS 2.0 feed. You can leave a response, or trackback from your own site. Oh, it’s so exciting for me that you’re coming through the canal: I can’t imagine how you must feel. In less than a week! I hope you manage to get your line handlers sorted without any issue. Good luck with the transit! Excellent that that little gremlin happened now rather than in a few days. Thanks for all the news, I love getting your updates. Best of luck on the transit. How exciting that you will soon be in the Pacific!